CHICAGO – It was 38 years ago that the seminal horror film “Halloween” was released, and its impact made a star out of the heroine in the film, Jamie Lee Curtis. Curtis was in the Chicago area in September to promote her new children’s book, “This is Me: The Story of Who and Where We Came From,” (illustrated by Laura Cornell). CHICAGO – There are a few major comedies on New Releases shelves this week along with some interesting, smaller films and one of the most anticipated TV shows of 2013. What options are new in the world of Blu-ray, DVD, streaming and digital TV providers? Some of the most interesting and most unbearable comeedies of the year hit your home viewing radar. Here’s how to rank them from ha-ha to hateful. CHICAGO – Christopher Guest, the beloved writer/director behind “Best in Show” and “Waiting For Guffman,” comes to TV this weekend with the premiere of HBO’s “Family Tree” and the result is something unique for television comedy — a show that doesn’t force the laughs as much as build likable characters. CHICAGO – The more one is familiar with the art of improv, the more one is bound to fall head over heels in love with the mockumentaries of Christopher Guest. Working from a mere scene outline, Guest and his ensemble of top-drawer comedians bring a colorful assortment of richly eccentric oddballs to life. Their ad-libbed dialogue is infinitely funnier than scripted punchlines since it emerges organically from their character’s own warped worldview. CHICAGO – Every few years brings another version of “The Princess Bride,” one of the most beloved films of all time. The latest is a 25th anniversary (yes, I feel old too) edition on Blu-ray, complete with an all-new 2-part featurette called “True Love: The Princess Bride Phenomenon.” That last word there is an over-used one but when you open the BD and see an ad for the “Princess Bride” game for iPhone, it’s hard to argue that Rob Reiner’s movie is NOT a phenomenon. CHICAGO – The CGI smorgasbord that is “Night at the Museum: Battle of the Smithsonian” is likely to suffice as a babysitter this holiday season as eggnog is made or holiday shopping is concluded. Families are likely to be satisfied by the everything-and-the-kitchen-sink mania that will work for toddlers hopped up on Christmas candy, but the film itself will collapse for their parents, babysitters, and even their older siblings. CHICAGO – Jeremy Kruse is a major part of Chicago’s vibrant film scene. The actor and writer has made a big splash with his short films, and now directs Emily Skyle’s “Fluffenhaus: The Comeback of a Pop Icon,” with an screening here September 17th. Ben Stiller returns as heroic museum guard Larry Daley. 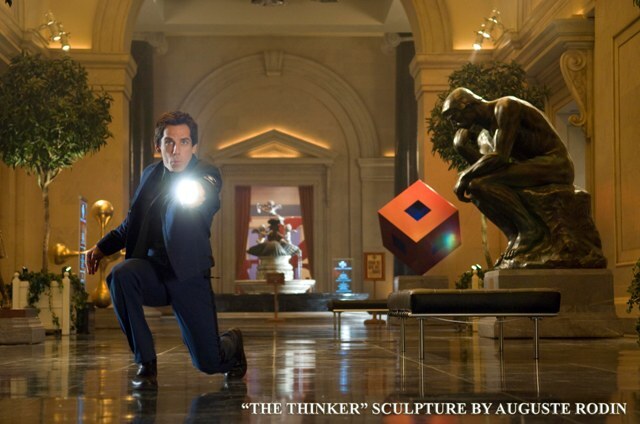 CHICAGO – This 29-image slideshow contains the official press images for “Night at the Museum: Battle of the Smithsonian” starring Ben Stiller, Amy Adams, Owen Wilson, Steve Coogan, Robin Williams, Ricky Gervais, Bill Hader, Hank Azaria, and Christopher Guest. The film, written by Thomas Lennon & Robert Ben Garant and directed by Shawn Levy, opens on May 22nd, 2009.